In may 2015, SK Brann was 10th in the second tier of Norwegian football, and seemingly on the way down to tier three just 8 years after winning the title. Rikard Norling, the swede who promised titles and joy, was fired, and in came the 51 years old relatively unknown and unproven manager Lars Arne Nilsen. Just a few weeks into his reign, the formerly hopeless looking team went on an unbeaten streak of 15 games and narrowly secured promotion. In november 2016, just 18 months after his appointment, SK Brann finished second in the Norwegian Premier League and got their first silverware since 2007. His turnaround of the club shocked every pundit in the country, and he deservedly won the Norwegian Manager Of The Year award for the 2016 season. 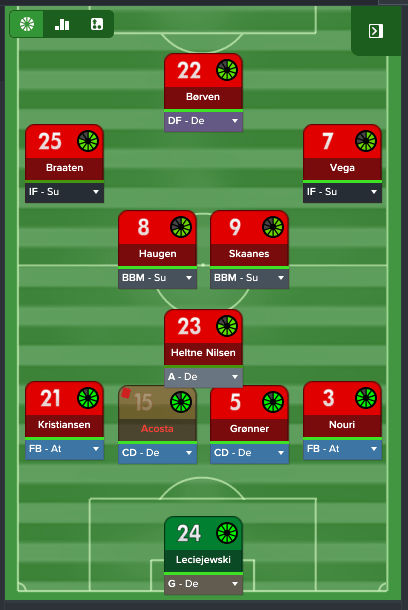 Nilsens successful tactics with Brann are built on defensive stability and dedication. His team let in only five goals at home in the entire season, and lost just a single game in Bergen. He utilizes the players physique, and values stamina, work rate and teamwork more than anything. Some fans and pundits accuse him of playing a boring brand of football, but no one can argue with his results and the extraordinarily short amount of time it took him to reach the top three of Norwegian football. 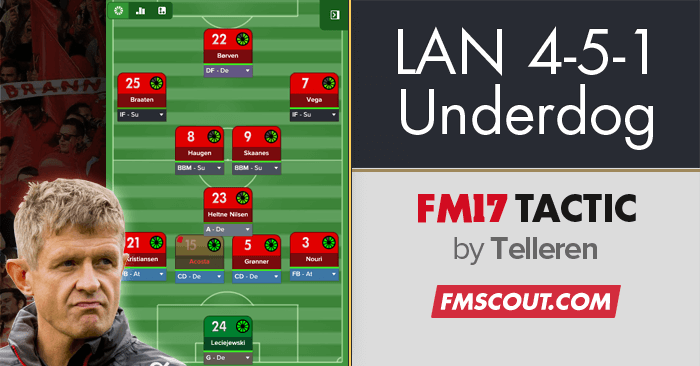 This tactic is well suited for underdogs who's looking to keep it tight at the back, and who would much rather win 1-0 than 4-3. 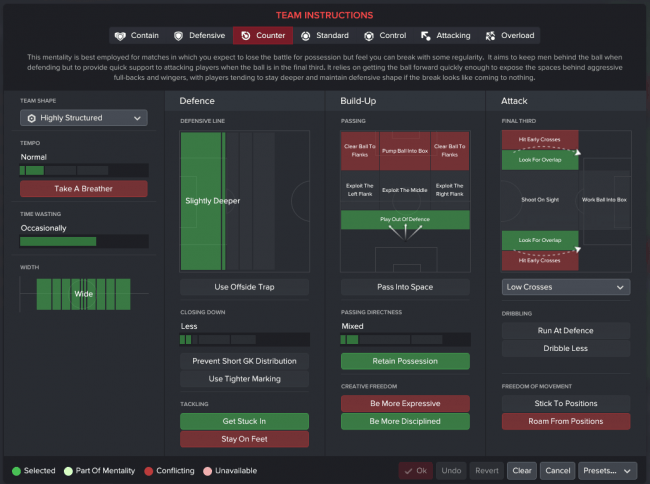 The main attribute you want in all your players is work rate, teamwork and stamina. The defensive players are crucial to the tactic. Perhaps the most important player, the anchor man, should have excellent anticipation and positioning, and good tackling and strength. The goal of the tactic is to keep the ball, take few risks going forward and not letting the opposition create any chances. The optimal game is one where both the amount of goals and shots on goal is 1-0. Some call it boring, but it brings results and can be an excellent way of over-performing with an inexpensive squad. What individual instructions u use? Surprise to read that it is considered to be a strong defensive tactics :). I played a lot with underdog teams and it was always a balanced tactics for me what I only used against similar or weaker opponents. Against stronger oppositions I usually used even more defending shape. going to test this in germany 3 division.. what training u use ? and do u use oi´s?